Email marketing is a simple and proven method of promoting your business. It can attract new customers and maintain close relationships with current ones, or remind lapsed customers that you still exist. You could opt to send emails using your usual email client (for example Outlook, Gmail or Thunderbird). However, it looks much more professional if you use specialised email marketing software. A vast array of email marketing software is available and most companies offer relatively low prices, with packages to fit every business size and need. There are even free-of-charge solutions available (although of course you will need to invest your time - or ask an agency like us to manage it for you). Managing your contacts can be as simple as having a list of names and email addresses, or a database of subscribers segmented in various ways. It's just a matter of determining which features and tools you need and what budget you have. Many email marketing plans include unlimited email sends each month, and invoice you based on your number of subscribers (i.e. how many people are on your list). If you have a small list of subscribers, your best bet will be a company that offers a free or low-cost plan for a few hundred subscribers, or even pay-as-you-go. MailChimp offers a free package and is very popular with small businesses. Many services also offer high-volume plans with up to 100,000 or more contacts. Some companies offer discounts if you pay annually rather than monthly. Getting started shouldn't be daunting. Generally, you'll know right away whether you like a user interface (UI) or not. Most packages will offer a free trial so you can have a look around before you commit (note that some free trials require a credit card, so if you’re not happy make sure you cancel the trial before you're invoiced). Check out the customer support. Some companies offer 24/7 phone support, live chat, and email help, while for others you need to rely on online documentation and limited live support. The best services offer a combination of FAQs and live support via chat or phone. Whether you already have a list of subscribers or are starting from scratch, email marketing software can help. It will let you add contacts manually (using copy and paste) or by uploading CSV or Excel files. Some allow you to import Gmail and other webmail contacts, or other data from CRM (Customer Relationship Management) software such as Salesforce. Managing users who unsubscribe is also easy, as you're not accidentally contacting anyone who has opted out. Next you need to build your first email newsletter. The best services offer several ways to do this; you can import your own HTML, start from scratch, or use a pre-designed template. Most services have drag-and-drop tools so you can choose to include, plus image libraries to store assets like logos and photos. Tools that let you test your emails for spam are also essential, as you may accidentally use words that send up red flags and direct the email straight to your subscribers' junk folders - or worse, get your emails banned before they ever reach your customers’ inbox. 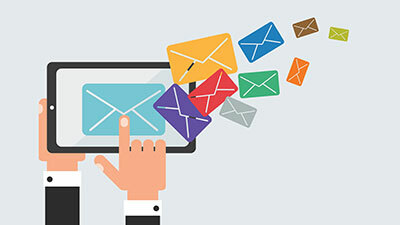 Beyond sending newsletters, the best email marketing services also offer custom auto-responders. These help you stay in touch with customers via automatically generated emails based on special occasions (like birthdays or anniversaries), welcome emails for new subscribers, or thank you emails for purchases. Obviously, using email as a form of marketing is no use unless you can track your successes and failures. All of the services available should offer tracking and reporting, whether it's simple open and click rates, charts and statistics, or even integration with Google Analytics. Using this data you can make adjustments based on what does and doesn’t work. If you’re growing your business, you may also be looking for a CRM solution. The more advanced email marketing services cross over into CRM. A handful of these services are ‘one-stop shops’, either offering both email marketing and CRM out of the box or as add-on services. Some of the best email marketing services are listed below – but others may be available! If you don’t feel confident enough to get started by yourself, drop us a line. We manage email campaigns for a number of our clients, including design, writing the words, broadcasting the emails, reporting, and maintaining the contact database.